The following three items appeared separately in the original version of the Around Naples Encyclopedia on the dates indicated and have been consolidated here onto a single page. adorns the walls of a modern metro station. Imagine yourself in a gondola, gliding along a delicate waterway, now and again passing beneath a quaint wooden bridge. Trees line and shade the footpaths on either side of the canal, and gentlemen and gentleladies are out strolling along the banks. Gracious villas are set back from the water's edge, and the faint melodies of late summer are in the air. Your spirit quickens a bit as the narrow waterway makes a final gentle bend and opens onto the majestic Grand Canal, lined by stately façades and crossed by picturesque bridges as it carries pleasure craft out—to the Bay of Naples! Grand Canal? Bay of Naples? But, surely, we are in Venice. Not exactly. We're in the Venice Quarter of Naples, part of an unfulfilled utopian scheme to change the city in the years before the turn of the century. Change is nothing new to Naples. Like medieval manuscripts written upon and erased over and over again, there has been new upon old in this city for a very long time. From the earliest Greeks to the present day, different civilizations have come and gone in the Bay of Naples and each has left its mark; the city, with a life of its own, has outlasted the single cultures that have formed her. It is still possible, for example, to find in Naples the intricacy of a medieval town, traversable only on foot and only by one who truly knows the way. The curved streets still conceal the secrecy and surprise of the Middle Ages, when you would turn a corner and find the small market or church hidden away. Moving forward in time a bit, you then find the imposition of Baroque order upon medieval clutter. When King Ferrante of Naples in 1475 characterized narrow streets as a danger to the state, he was but giving political voice to the new Baroque aesthetic of the straight and wide avenue, the open square and the imposing façade. The Naples that we see today, then, has very visible traces of a long history, but the shape the city has taken in this century is largely the result of things done or left undone in the latter half of the nineteenth century. Following the unification of Italy, Naples lost its role as a capital, and was faced with deteriorating social and hygienic conditions. Class differences and the inability of the city to plan and execute long-term urban goals put Naples behind other Italian cities in preparing for the new century. Enter upon this scene in the 1870s a Neapolitan born of a Scottish father and Indian mother, Lamont Young, one of the most fascinating characters in the history of utopian urban planning. His plan, approved by the Naples City Council in the early 1880s, had it come to fruition, might have made the peaceful vignette of the opening paragraph reality instead of fantasy. "Utopian" has come to mean "impractical," but Young was quick to insist that his ideas for the Naples of the future were workable and economically beneficial. The key to Young's ideas on how to deal with the problems of urban sprawl—already evident in the Naples of the 1870s—was good mass transportation. A number of factors convinced Young that underground transit was the solution. For one, building new streets was difficult due to the layout of the city between the sea and hills. Young foresaw chaos if all traffic in a city such as Naples, with the same surface area as London and Paris, but twice their populations, stayed above ground. He rejected the piecemeal urban expansion of the city and the gutting of the historic center as a solution to the problem, since it involved impractical large-scale removal and relocation of the inhabitants. Instead, he favored a gradual and planned expansion away from the center—a "suburbanization"—by means of a metropolitana, an underground train system, which he would design and build. In the late 1870s the City Council called for proposals for a transit system. Young's plan involved (1) steam locomotives for tunnels to be built beneath Montesanto and Posillipo; (2) Tramways—horsedrawn cars on tracks, and (3) the Omnibus—horsedrawn cars, but no tracks. The plan was rejected because it was too complicated. In December of 1880 he presented a new plan to the City Council, complete with approximately one hundred tables and drawings. It detailed an extensive metro network of twelve stations along a 22 kilometer route from Fuorigrotta to the main train station, replete with passenger lifts to Vomero connecting to narrow gauge railways to the outskirts. The Metro rail gauge would be compatible with the state trains already in use, thus allowing the state railway to use the Metro tracks. Although the plan was generally treated kindly in the press, it was eventually turned down, and it is not exactly clear why. Perhaps it was due to general fear of structures collapsing from construction along the planned route. To meet this fear, Young modified his plan in 1883. Changes consisted largely in elevating some underground sections from beneath populated areas to run on the surface or overhead, leaving underground only those sections that passed necessarily though hills within the city. The plan entailed the creation of two new quarters of the city: one, a Venice Quarter, along the coast of Posillipo, and, two, a tourist and residential quarter in Campi Flegrei, west of the city, beyond the Posillipo hill. This new plan was published in 1883 and was entitled "The Metropolitana and Campi Flegrei," and it stressed safety. The underground stretches were through the tufa, deep in the hills, while the surface portions were away from residences or elevated to run high above roadways. The line started west of Naples in Bagnoli and covered the entire center of the city as well as the suburbs. 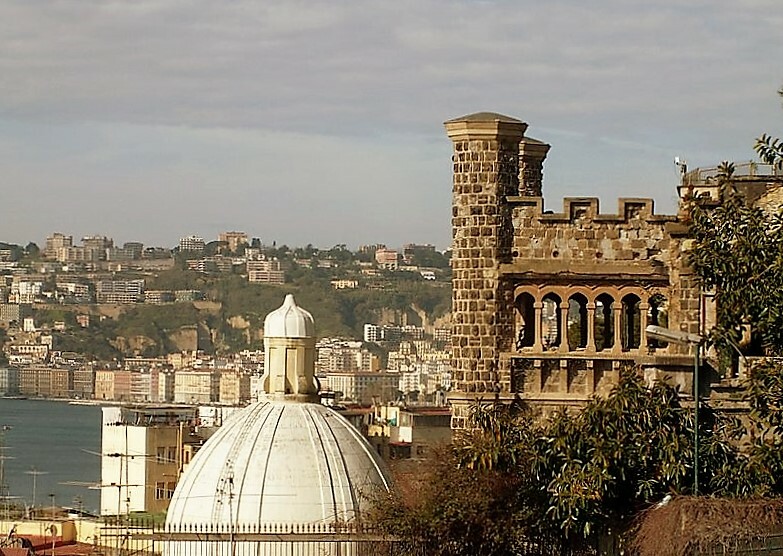 It included the difficult hill areas of Fuorigrotta, Posillipo, Mergellina and Vomero, as well as the densely populated parts of the inner city and the central train station. From the station, elevated sections ran along via Marina and Riviera di Chiaia and back to Mergellina and Bagnoli. A separate line branched in from the seaside to handle the most densely populated downtown areas. Ingeniously, there were two separate Vomero stations, with passengers rising by lift 160 meters from the bottom station to the top one, where they could connect to railway lines for outlying areas. Young's 1886 revision to the plan also included a "hill line" running from Capodichino through Vomero and on to Posillipo. It showed considerable foresight, anticipating the hill communities that later were to spring up in those areas. The need to dispose of the material excavated along the Metro route led Young to propose using the material as fill along the picturesque Posillipo coast for a giant reclamation project. Young's plan was to have the land-fill cut by navigable canals of sea-water, thus creating artificial islands interconnected by bridges. Buildings and gardens on the islands would "give to our quarter the appearance of a tiny Venice," a 1500-meter extension up the Posillipo coast of the newly completed via Caracciolo, an avenue running along the sea from the historic section of Santa Lucia up to Mergellina along the old Royal Gardens of the Bourbon dynasty. For those who saw his idea as too romantic, he claimed it was based on solid economics: He thought the combination of a mini-Venice with the natural beauty of the Bay of Naples would put Naples virtually at the top of the world property market. The whole Venice area covered over four square kilometers; half for canals and streets and half for land to build on, much of which, however, would be gardens, keeping a favorable ratio of open spaces to buildings. The waste disposal system was well thought out, and the whole quarter rose 2,50 meters above the sea to keep dampness out of the dwellings. The main street, an extension of via Caracciolo, passed over the canals by a series of bridges. One long canal, Partenope, was crossed by seven secondary canals, all with outlets to the sea and to each other. The general effect was of smaller canals leading off of three larger ones which formed a letter "Y", the stem of which was the Grand Canal. Within the network was a large circular canal hub, the Venice-end of the canal-tunnel to be dug through Posillipo to Campi Flegrei. (Difficult, but not impossible—the Romans built a similar tunnel two thousand years ago, which may still be visited today.) Young's canal would be almost two kilometers long, and he was convinced that it would eventually prove to be the main connector between the west side of Naples and the new quarter in Campi Flegrei. Young's illustrations for the project are typically Victorian with their neo-Gothic buildings, bridges and towers. Young's plans re-created Campi Flegrei, the area north of Naples beyond the Posillipo hill. The area focused around two central points and included the "Crystal Palace" and a number of hotels and beach establishments, private villas, exposition halls, and thermal bath facilities. Fuori Grotta, the area farthest from the sea, housed the metropolitana station, residences and the Crystal Palace. Other sections sloped gently down towards the sea and were given over to villas and gardens; the seaside area was a beach resort and included a zoo, shops and hotels. There were also two artificial lakes and a series of canals which joined the main one leading beneath Posillipo to the Venice Quarter. Young emphasized greenery and trees. The general impression was of a vast park with an occasional structure. Numerous parks and gardens allowed, according to Young, ample space for gymnastics and games. There was an English garden and an Italian one; small game abounded and Swiss chalets dotted the small hill known as S. Teresa. The whole area had a network of wood or metal bridges over the canals. Also, a narrow-gauge electric railway linked up to the metropolitana. 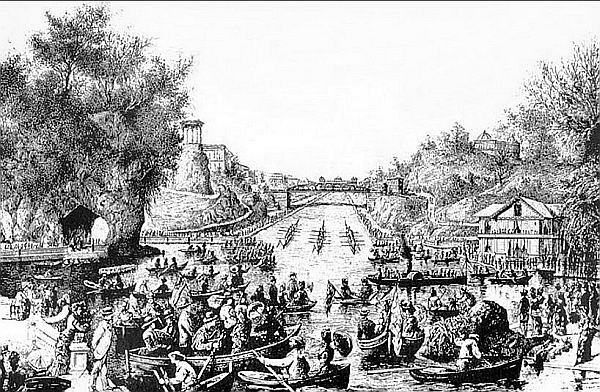 The most interesting structure in the area was to be the Crystal Palace, on the shores of the Small Lake in Fuorigrotta and named for the Crystal Palace of the Universal Exposition in London in 1851. It would be a showpiece for Neapolitan Art, theater, exhibitions and concerts. Young, however, viewed the structure also as a means of educating the people. It was an all-purpose cultural establishment, so that "those who cannot travel or who are not widely read…may have a temple in which science can speak to the imagination…where they may learn how the human spirit has developed." Via Marina (the road now running along the main port of Naples) and the new via Caracciolo meant, for all practical purposes, that there were no longer any real beaches left in the city, itself. Young saw the bathing resort in Bagnoli as a way to give Neapolitans back something they had lost. He designed a bathing pier for Bagnoli: it formed three sides of a rectangle; the first leg ran 400 meters along the beach in Bagnoli opposite the tiny island of Nisida and provided dressing rooms. The other two sides were long double–decker piers in the water, letting you stroll along in the shade or take a dip, as you desired. The facility was to accommodate 20,000 persons a day. Such a plan necessarily called for a hotel to go along with it. After all, the resort was as much for tourists who would stay a while as it was for day trippers from Naples. Young wanted a hotel that combined the majesty of the hotels at English seaside resorts with the comfort of the resort hotels in America. It was to be on the shores of the Greater Lake. The most striking feature was the 50–meter high metal and glass dome, visible form the entire area. Inside, there were restaurants, thermal baths and a magnificent Winter Garden, tropical plants and all. Adjacent to the hotel and forming a symmetrical whole with it were two thermal cure baths. Young emphasized that although one of the facilities might serve the well-to-do clients in the Hotel Termine, he intended the second one for everyone, "for all social classes". Young saw Naples as becoming another London or Paris. "I see the city of my dreams, Naples, fifty years from now, risen majestic and enchanted in the most beautiful area in the world." Young's "fifty years from now" never worked out. The population explosion and the overwhelming influence of the private automobile (entirely unpredicted in the last century, even by those who foresaw flying machines!) have done much to confound the plans of visionaries, Young's included. Aside from those things, however, how practical was his idea? His critics say he showed a typically English lack of interest in the bonds that Neapolitans, historically, seem to have to have to the center of their city. He would, they say, have created a city with quarters for the rich, virtually ignoring the needs of the poor. He ignored the possibility of industry in the area. He made no plans for large numbers of working class, rather seeming to think that those who worked for a living would remain a fixed number and have to do only with managing tourism. 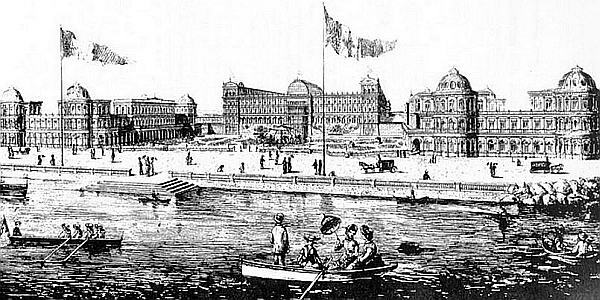 His plans for a Venice Quarter and a leisure resort in Campi Flegrei amounted, they say, to little more than an anachronistic Victorian fantasy, instead of a realistic attempt to deal with the coming century. Much of the criticism of the Venice idea was that it was too "poetic". Young, however, was always quick to point out the economic and practical advantages of his plan. He was convinced that his idea to decentralize the city by rapid transit was a good practical idea. Young was not optimistic about getting his plans approved; he felt there were vested interests working against him. In spite of his pessimism, he was given the go-ahead by the city council, contingent upon his ability to raise the money. And here the story ends. The building time was set for five years. Young was given six months to set up a private consortium to finance the project without state intervention. He had apparently been relying on English banking interests for support. The six months ran out without the necessary financial support and the city council granted an extension. It, too, ran out. Young's plans may well have been an anachronism, in the sense that they were too forward looking. Today, Naples is still in the midst of building a satisfactory underground railway line. 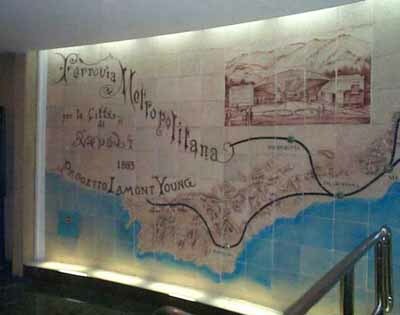 Ironically, on the wall of one the stations of the new line there is a beautiful ceramic map displaying Young's original plans for a Naples Metro from 120 years ago (photo, top of page). The suburbs of Bagnoli and Campi Flegrei suffered the industrial blight of a steel mill and a cement factory for almost a century. Both of those enterprises have been abandoned and the area is now priming for an episode of non-industrial urban renewal on its own, based on the spectacular natural beauty of the bay. These plans include luring the next America's Cup regatta to the waters of Bagnoli. Meanwhile, the nearby tourist resorts of Sorrento and Capri thrive on the leisure time of tourists, a recent phenomenon that Young's critics could not have foreseen when they labelled his vision of a new Naples an anachronistic Victorian fantasy. Lamont Young's "castle" (photo, directly below) is going to be restored. 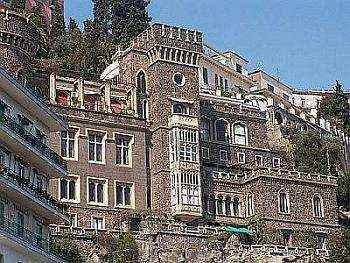 It is a quaint piece of Victorian Gothic architecture set on the cliff of Pizzofalcone, the original cliff of Naples that overlooks the Castel dell'Ovo and the small harbor of Santa Lucia. When it was planned in the early years of the 20th–century, it really would have overlooked all that; however, by the time it went up (1922) construction along the seaside road led to the pitiful sight of a "castle" from which there was no view at all except of the splendid backs of hotels now directly in front of—and considerably higher than—the cliff. The castle was one of three or four such buildings put up by Young along the same unusual lines, highly criticized at the time as being not in keeping with the traditions of Neapolitan architecture. 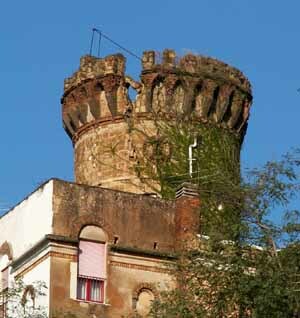 One of Young's other castle-like Victorian Gothic structures in the Chiaia part of town, above Parco Grifeo, even features an artificial crack high up on one of the towers (photo, directly above), meant to simulate great age or, perhaps, a lightning strike. All of these buildings would be at home on the covers of gloomy novels about moors, fog and frail heroines. The buildings are, however, charming, and the one on Pizzofalcone (photo, right) is now going to get one–and–a–half–million euros to undo the damage down by arson a few years ago; in addition, part of the grounds will be converted to a museum/exposition room that will inform visitors about this fascinating Neapolitan with the very English name. Here they will learn about Young's plan for the total rebuilding of the city (including the construction of an underground train line!) in the 1890s (a plan that lost out to the Risanamento—the gutting of large sections of the city). The building shown directly above, Lamont Young's home on Pizzofalcone, has had a gloomy history, which, however, may now be taking a turn for the better. First of all, Young named the villa for his wife, Ebe Cazzani, and technically it is still called Villa Ebe. Second, Lamont Young, distraught at the turn his own life had taken (his plans for the city had been rejected, and his own view of the sea from the historic height of Greek Naples was now closed to him forever by block after block of new high-rise hotels thrown up by the risanamento—in short, he was a failure) committed suicide by pistol-shot in the villa. The premises decayed over the decades, somehow survived WWII but continued to decay. The arson attempt to destroy the premises in 2000 was serious and was almost the death knell for Villa Ebe. Yet, on the verge of demolition, it was saved: good-hearted volunteers, private organizations and the city got together to save it. For the last two years, work has been going on to restore "The Gardens of Villa Ebe," to restore the interior and turn it into a tribute to its architect. The practical but quaint (if that is the word!) (pictured, above left) switch-back ramp leading up to the villa has already been renamed the rampe Lamont Young (number 8 on this map). God, I hope they don't screw this one up. From the above items about the general life and career of architect Lamont Young. You will gather that none of Young’s grandiose plans from the 1880s—not the metropolitana, not the Venice Quarter, not the grand seaside resort in Bagnoli—none of that came to fruition. It all shattered against the risanamento, the great and drastic urban renewal of the city in the face of the terrible cholera epidemics of the 1880s. At best, we have handed down from Lamont Young, a few individual buildings, the most impressive of which is the Aselmeyer Castle on the Corso Vittorio Emanuele (C.VE), in these photos. Young had to give up on his sweeping plans to rebuild entire sections of the city once it became clear that the city council was going ahead with the risanamento. He, thus, concentrated his efforts on putting up some individual buildings that still stand today. In 1895, Young acquired the rights to build on sections of the C.VE. (At the time, that street was almost bucolic and nothing like the mass of buildings you see today.) Even then, his plans reached well beyond what actually wound up being done. 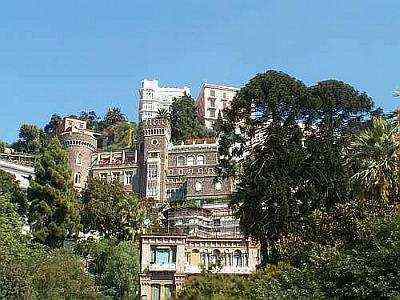 For example, he had come into possession of the Villa Lucia in the Floridiana park in the Vomero section, high above the C.VE. He proposed joining that property to the C.VE with an elevator: you would have his Villa Santa Lucia at the top and a new hotel, which he proposed to build, at the bottom. After all was said and done, he had to give up his plans for the new hotel (although construction was partially completed and even today serves as a conference and reception hall. (It is named for one “Bertolini,” who acquired the building from Young in the early 1900s.) Young had to settle for simply putting up as his own residence on the C.VE, the building seen in these photos. It was built in 1902 and sold two years later to banker, Carlo Aselmeyer, whose name the building still bears. (More correctly, the name of the building is Castello Grifeo dei Principi di Partanna.) 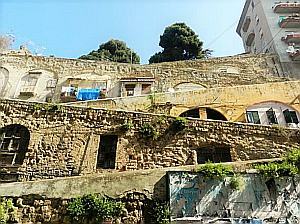 Young moved away to the small isle of Gaiola on the Posillipo coast. Architecturally, the building is, quite simply, English Gothic (“Dracula Victorian,” as they say) as are most of Young’s other works. (An exception is the Neo-Renaissance Grenoble Institute on via Crispi.) That was the greatest criticism levelled against him—his buildings don't look as if they belong in Naples. (Well, that was the second greatest criticism; the big one was that his sense of “city” was not Neapolitan; it involved the new concept of “urbanization” —moving people out of the center of town (using his never-to-be-built metropolitans as the primary people mover). That may not have been Neapolitan, but that is, however, what eventually happened, anyway, with the invention of the automobile, with or without Lamont Young.) A fair criticism would be that he thought Naples could eventually live from tourism. New 20th-century industry played no role in his thinking. In any event, the Aselmeyer Castle still exists but has been kept up only marginally at times. It has long since been sub-divided into many different apartments and suffers from the same problem that all condominiums do in Naples: you can’t get everyone to agree on major repairs. The building has also been architecturally defaced by two additions on either side of the main entrance: cream-colored, smooth blocks of junk not in keeping with the rough-hewn stone of the rest of the building.